It’s late one morning in early October, and Rakesh Khurana is moving around. The new dean of Harvard College has a few rare minutes of downtime to spend in his new office in University Hall between two of his regularly scheduled meetings, though he barely sits down. He hovers first, pages through a binder on his desk, and then sits briefly at his computer. Perched on top of the monitor is a miniature robot, one of the first toys his parents bought him after they emigrated from India to the United States when he was a child. Behind his desk are two cans of tea and an electric kettle; Earl Grey is his caffeinated beverage of choice. He only spends a few minutes in front of the computer before Associate Dean of the College Joan Rouse, who is more or less Khurana’s chief of staff, sticks her head into the room; she needs him to look something over. Khurana promptly walks out of his office and joins her in the hallway. Soon enough, he’s back. But not much later, he calls out to his assistant and, with a stack of papers in hand, paces in and out of the room. He jokes to everyone he sees today that watching him work is like “watching paint dry.” But in just a few hours, Khurana moves from place to place to meet with several of the College’s major players, from the president and vice president of the Undergraduate Council in the morning to University President Drew G. Faust in the afternoon. Just a few months into the job, he’s hitting the ground running. Rakesh Khurana, many close to him will tell you, is a visionary—an earnest, quick-walking, fast-talking visionary. The excitable dean has been clamoring at every chance he gets to sell his vision for Harvard College, which he says will help defend Harvard’s educational model. This Business School professor, tapped to lead Harvard College through a changing educational landscape that some fear undervalues the liberal arts, is nothing if not on a mission. Khurana, a scholar of leadership and organizations, crossed the Charles River to the College to rearticulate its purpose and retool the workings of its administration. 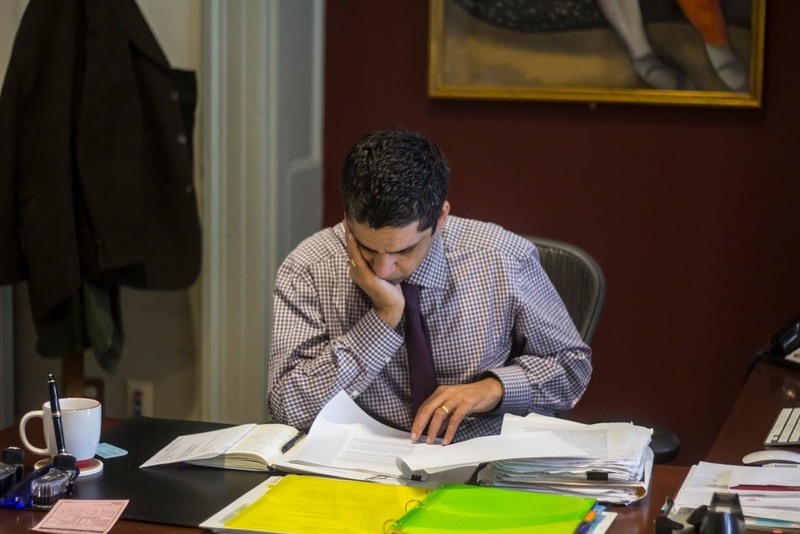 A man who both studies and eschews hierarchy, Khurana is carving a niche as the administrator uniquely positioned to set the tone guiding the decisions that others embedded in Harvard’s bureaucratic structure will ultimately make. Khurana has always been a man of big ideas. Max Weber and John Dewey and their writings on bureaucracy and education, respectively, are his intellectual influences. Unprompted, he laments the ubiquity of cynicism and the lack of idealism among people today. He talks about the value of intellectual community with as much fervor as one might expect from a House master, but with additional zest. That intellectual drive was evident during his student days at Harvard Business School. In 1993, fresh out of working at a small technology firm in Cambridge, Khurana began graduate work; he would eventually earn his Ph.D. in organizational behavior after studying at both the Business School and in the Faculty of Arts and Sciences’ Sociology Department. From the moment Khurana stepped into the classroom, the Business School professors who would later become his colleagues identified him as unique. By the time Khurana left campus for an assistant professorship at MIT in 1998, senior professors at the Business School were determined to one day bring him back, according to another of his mentors, Jay W. Lorsch, a professor in the Business School’s Organizational Behavior unit. Two years later, he did return, at the urging of an especially close mentor and friend, Nitin Nohria—now the Business School’s dean. As he climbed the tenure track, Khurana differentiated himself from his peers. Scott A. Snook, a senior lecturer of business administration, remembers Khurana as one of the only junior faculty members willing to speak up at Business School faculty meetings. The consensus today is that Khurana was a natural pick to lead the College; as a beloved Cabot House master, he spends more time with undergraduates than does the average member of the Business School faculty. But on the whole, his resume tells a different story. By 2008, Khurana had earned tenure at the Business School, and soon the newly-minted Marvin Bower Professor of Leadership Development was on his way up within the school’s Organizational Behavior unit. Working with Nohria and Kanter, he co-founded a cross-Harvard development program for leaders in 2009. Soon after, he was selected to serve as the course head for a required first-year MBA curriculum on organizational behavior. “Everybody thought he would be one of the leaders of the unit for years to come,” says Lorsch from his office, only a few doors down the hall from Khurana’s now-infrequently occupied space in Morgan Hall at the Business School. A group of professors at FAS had other plans. After a cheating scandal roiled the College in 2012 and its dean stepped down the next year, FAS Dean Michael D. Smith tasked 21 faculty members with advising his search for the College’s next permanent leader—a dean who would step in after a period of both internal and external strife. Late last fall, the search committee approached Khurana with a question: Would he be interested in trying for the job? Khurana, for his part, says he had no plans to apply for the position before being asked. “It was not something I had on my horizon,” he says. Surprised, he went ahead and interviewed, but doubted that his chances were strong. “I thought it was nice to be nominated, that it would be nice to share with the search committee my thoughts about the undergraduate experience—what it was, where the opportunities were—and that was about as much as I had considered,” Khurana says now. The Business School professor wasn’t a traditional candidate to head a liberal arts college. Although a sociologist, Khurana’s primary academic appointment is at a professional school. Several other people considered for the position, according to a source directly involved in the interview process, had day jobs that were more directly tied to the liberal arts and sciences: they included Edward J. Hall, a Philosophy professor and the chair of the Committee on General Education; Kay K. Shelemay, who holds appointments in both the Music and African and African American Studies departments; and Jonathan Holloway, then the chair of Yale’s African American Studies Department and master of Calhoun College. He was appointed Yale College’s dean in May. In January, Smith offered Khurana the job. Lorsch recalls that Khurana asked him whether he should accept the offer. “You spend 10 years grooming somebody to do something, and then he gets plucked out to do something else, you’ve got to have a little bit of remorse,” Lorsch says. Still, he advised Khurana to go ahead and do it. Khurana assumed the role on July 1. Dean Khurana paces the aisle outside his ground floor office in University Hall early one afternoon in late September. He stops and pokes his head in the door of the College’s new dean for administration and finance, Sheila C. Thimba, who joined the Dean’s Office after leaving Rutgers this summer. He sees that she’s busy, says they’ll talk later, and moves on. Such interruptions are a common occurrence in Khurana’s University Hall. Khurana runs his office with the attitude of an organizational leadership scholar. An academic who studies executive labor markets and whose work berates the “curse of the superstar CEO,” he is skeptical of top-down leadership, and it shows in conversation about his own staff. He repeatedly describes the distribution of power at the College as “flat.” He even renamed the team of senior College staff advisors, known to his predecessors as the Dean’s Cabinet, because he thought that sounded too hierarchical. The staff in Cabot House have long been used to Khurana’s leadership methods. He and his wife Stephanie Khurana have been running the House this way since they became co-masters in 2010. According to Emily W. Stokes-Rees, Cabot’s former resident dean who left last spring for a tenure-track position at Syracuse, he and Stephanie ran the House as a team, with structure in a “functional sense”—convening meetings with the relevant staff members depending on the topic—but no real hierarchy. There is “no doubt” that Khurana’s studies influence his approach to “everything,” Stokes-Rees says by phone, though Khurana does not go into staff meetings and announce it. “I think he lives it,” she says. 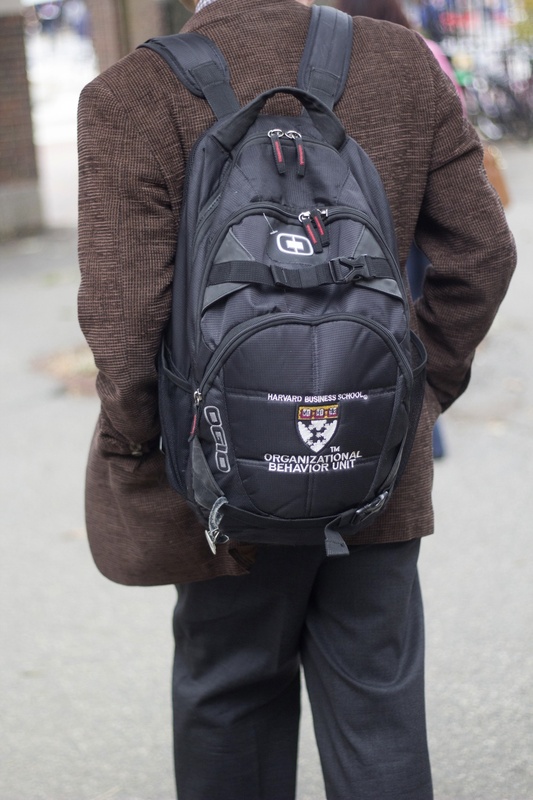 When he heads down Garden St. to work every morning—he starts his day at 7 a.m., assuming he catches the shuttle from the Quad—Khurana carries his things in a distinctive black backpack, emblazoned with the Business School’s crest. He has used it for about three months now; he stopped carrying his old bag after his kids made fun of the ink stains at the bottom. One could call it symbolic. With the bag, Khurana carries a piece of the Business School with him everywhere he goes. His repetition of the College’s mission—even to people who hear it every day—connects back to his core belief that organizations must stay focused on their purposes. He begins every meeting with it. Colleagues immediately point to Khurana’s articulation of the mission as something that orients their work. It’s also, they say, what differentiates him as dean. Khurana says he developed his conception of the College’s mission through meetings with students and faculty and in studying the school’s history as he prepared for the deanship last spring. Annenberg is Khurana’s dining hall of choice at lunchtime one Friday in early October. For all the lofty discussions about organizational behaviour and the state of higher education, Khurana likes to talk to students. By his count, he spends three-fourths of his time doing it. After he grabs a green tray and silverware, Khurana jumps in the lunch line. Along the way, he greets a freshman and decides to join him and his friends for lunch. Conversation at the table quickly turns to politics: The night before, Vice President Joe Biden spoke at the Institute of Politics, and Khurana and his son sat in the front row. The freshmen ask questions about the event. Khurana, in turn, takes out a blue notebook, quickly flips through its pages, and reads aloud his notes on the remarks for the benefit of the group. Thirty minutes later, Khurana and the freshmen have talked about everything from baseball to advice on buying proper winter boots (he’s a former Mets fan, and he recommends the waterproof, not the water-resistant, variety). Like this one, conversations with Khurana tend to veer off in all different directions. When the dean talks with students, and really everyone else, his jokes are generally self-deprecating. Coupled with his signature laugh—Stephanie Khurana’s favorite thing about her husband—even the most serious interactions with Khurana are likely to have their lighter moments. Stokes-Rees describes Khurana as “student-focused,” a characterization to which he almost certainly would not object. He regularly begins his day with 7:30 a.m. breakfast in Annenberg and ends it with a couple hours at the student-run Cabot Café back in the Quad. “I think it’s really important as the dean of the College to be really in touch with where the students are,” Khurana says. Dean Khurana sits down at lunchtime to chat with freshmen in Annenberg. Khurana says he spends three-fourths of his time talking to students. The students, in fact, are a large part of why he took the job. He attributes much of his personal development to his time as a House master in Cabot. To serve both as the College’s top administrator and the head of a House means a tight schedule, but when he accepted the deanship, he and Stephanie chose to stay on in the Quad. 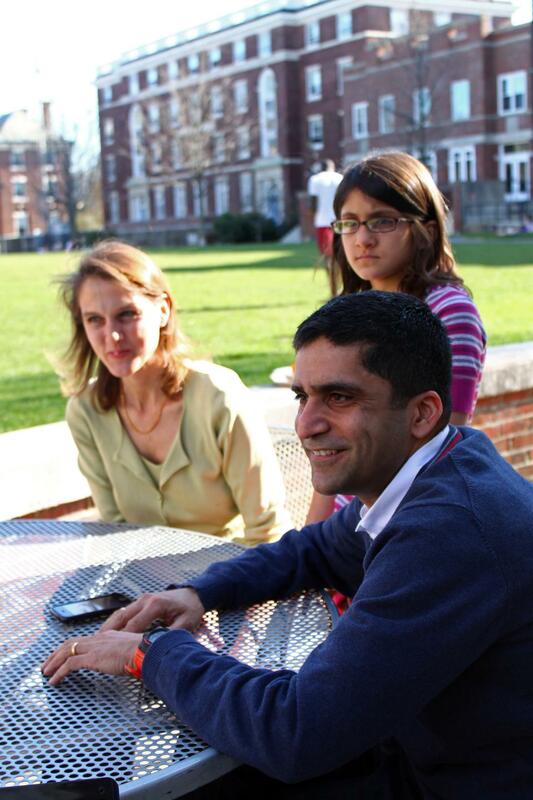 In his quest to improve undergraduate education, Khurana hopes to advocate for the liberal arts during what he describes as an “inflection point” for the state of higher education, as technologies change quickly, college costs increase, and students feel pressured to learn professional skills in the classroom. Khurana calls for a focus on adjusting Harvard’s conception of a liberal arts education to the 21st century. In conversation, he compares the present juncture to the transitions ushered in by former University Presidents Charles W. Eliot, Class of 1853, Abbott Lawrence Lowell, Class of 1877, and James Bryant Conant, Class of 1914. Both Conant and Eliot, a portrait of whom sits just outside Khurana’s office, introduced undergraduate curricular reforms, while Lowell developed Harvard’s residential House system and the academic concentration. Unlike the former University leaders he now invokes, though, Khurana sits not at the helm of, but firmly entrenched in, Harvard’s bureaucratic structure. Regardless of his desire to run his office non-hierarchically, as dean of the College, Khurana is formally the superior of both the deans of student life and undergraduate education. But while College administrators can help shape the undergraduate curriculum, they hold little formal sway over the professors charged with applying it, who report not to Khurana, but to the man who hired him, FAS dean Smith. Khurana was the main faculty member on the subcommittee that drafted the College’s new honor code, according to interim Administrative Board Secretary Brett Flehinger, but even that had to be approved by the Faculty before its implementation. In fact, faculty members debated the proposal at three of their monthly meetings last spring before it passed. Admissions and the renewal of the House system that Khurana envisions as the cornerstone of social life for undergraduates, similarly, fall under Smith’s jurisdiction. Just last week, when Khurana took suggestions from students at a discussion about how the College could improve emergency email communications, he acknowledged that he and the College do not exist “in a vacuum,” but rather within the context of the FAS and central administrations, in addition to law enforcement. In other words, he could not promise to act on students’ requests on his own. People in the Dean’s Office suggest that Khurana is aware of and open about his lack of pure policy-making power. His influence instead derives from his ability to work with the College’s various constituents and drive home what he sees as its mission, they say. To Dean of Freshmen Thomas A. Dingman ’67, “a lot” of Khurana’s job will be to set the tone. As a lecturer at the Business School who studies organizational leadership, Snook agrees that constantly repeating one message, in this case the mission of the College, to tenured faculty and other administrators is Khurana’s best shot at effecting change. Khurana, for his part, speaks about his role thoughtfully later in his University Hall office. It goes back to being a student advocate, he says. What power Khurana has, he is determined to distribute among people below him. In line with his intellectual propensity to distrust concentrated authority, he describes his leadership philosophy as enabling other people to make the decisions that most affect them, instead of making them himself; in his own words, he is a democrat with a “little ‘d.’” Colleagues say this stems, in part, from his near-total trust in others. In Cabot, this meant that he supported projects like the creation of Cabot Café while letting students take charge. Stokes-Rees, the former resident dean, says Khurana and Stephanie are focused on students in the House without wanting to do everything for them. 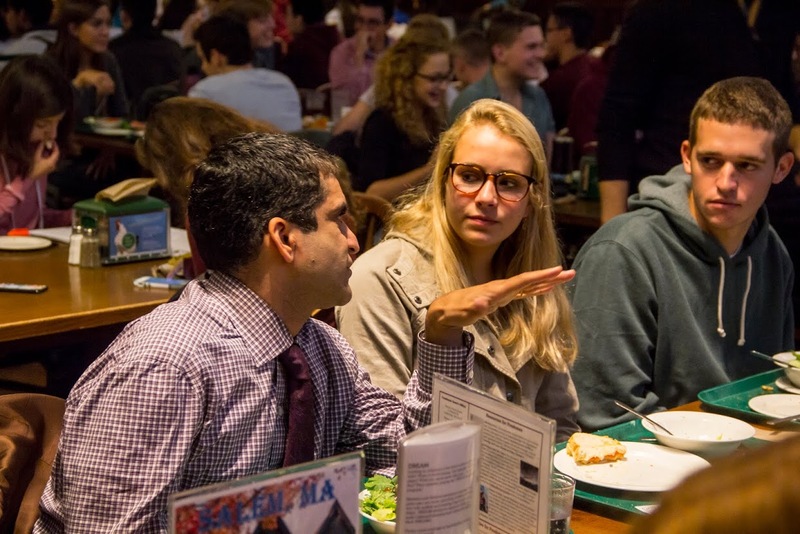 Since Khurana became dean of the College, this philosophy has already manifested in at least two decisions that affected day-to-day student life. Given his outspoken prioritization of the House system, one might assume that Khurana played a large part in effecting the recent change to Inter-House dining restrictions, which essentially asks students not to eat outside their own Houses on Thursdays. Not so, says Khurana; the House masters collectively came to that decision after the dean recused himself from the deliberations. Similarly, when a student-administrator committee on student group transportation safety presented its recommendations to Khurana earlier this semester, he increased funding for domestic student group travel grants by $30,000 and instructed the group to determine how those grants should be allocated. This style reflects what Business School professors point to as the defining characteristic of Rakesh Khurana, the professor. Instead of dictating to students at the front of the school’s classic semicircle classrooms, Khurana deliberately teaches from the back of the room, amplifying the student voice by diminishing his own. When a racially charged death threat hit hundreds of students’ inboxes a few days into October, Khurana faced the first major campus disruption of his deanship. Students, dissatisfied that their new dean had not yet sent the full student body a message acknowledging the nature of the threat, criticized the administration’s response. For Khurana, the episode was a first test of his leadership technique. While two other deans in his office had reached out to all undergraduates in the days immediately following the threat, Khurana did not. Under the conception of a Dean’s Office composed of a group of equally important administrators, an email from Khurana would not have carried more weight. But some students wanted to hear from the dean, if only because his job title placed him above the rest. The day after students aired their grievances at a community discussion event, Khurana called Crimson reporters into University Hall and assumed full blame. Referencing prepared notes, he vowed to improve communication in times of crisis, then added, unprompted, that the incident had also convinced him of the general need to better inform students about the inner workings of his office. He had planned to lead by example, he said, but now realized that students might need a more explicit explanation of his non-hierarchical philosophy. He sent them an email about the threat later that day. As the College prepares to implement its first-ever honor code, embarks on an ongoing review of its General Education curriculum, and faces a federal probe into its adherence to Title IX, Khurana is trying to change the way its administration functions and communicate that difference to students along the way. Back in University Hall last Friday, after hosting a separate, follow-up discussion in Phillips Brooks House about communications in the wake of the threat, the typically quick-talking dean slows down. Dean Khurana reads through a stack of papers in his new office in University Hall during his "downtime".